History will be kind to Julia Gillard. Take this is as a relative rather than a qualitative judgement. History will have to be kinder because it would be impossible to be as harsh as current readings of her political character and policy achievements. To be clear, this piece isn’t going to be about the rights and wrongs of the extraordinary dance-of-death between Gillard and Rudd since 2010, nor about the way Labor dispatched Gillard. Australia deserves the best years from the best leader available. A tough system decides who gets the toughest job in the country. Part of the way this works is in the capacity to change leaders. No one watches the performance of MPs and Ministers more closely than their own colleagues. The judgements of the Labor Caucus or the Coalition Party Rooms can be brutal. But few can doubt the efficiency of the system in changing leaders and changing course. The speed with which Labor and Australia have zoomed away from Julia Gillard is a demonstration of the tough system in operation. Before we all board the roller coaster for the spills and thrills of the federal election campaign, pause to focus on one bit of the Gillard record where history will be relatively kind. Consider the judgement that as a one term Prime Minister, Gillard did a better job on foreign affairs than the first term efforts of John Howard or Bob Hawke. Gillard stands equal with Rudd’s first term. And given Rudd’s much greater knowledge of foreign affairs, Gillard did better in a few key bilaterals, notably with China and India. Howard and Hawke ended with far more international achievements than Gillard, but they did this mostly in their second, third and fourth terms; they had the chance to improve with time. To compare like with like, look only at first term performance. The proposition rests on the understanding that most PMs have problems with foreign policy in their first years in office. The men and the woman who have arrived in The Lodge get there by winning over their Party and then a domestic constituency; suddenly, they’re required to devote the same skill set to a completely different set of stages and peoples. The first term problem is compounded by Australia’s strange custom of giving the Foreign Affairs job to deposed leaders. Hayden, Downer and Rudd were all invited to spend a large amount of time out of the country to help the peace of mind of the country’s leader. The deposed-leader-as-Foreign-Minister habit adds an extra frisson of tension to a new PM’s interaction with international affairs. In recent times, only Keating avoided the first term trap. He inherited an experienced Foreign Minister who wasn’t a previous leader. Keating put his big focus on just two areas—Indonesia and APEC— and left the rest to Gareth Evans. 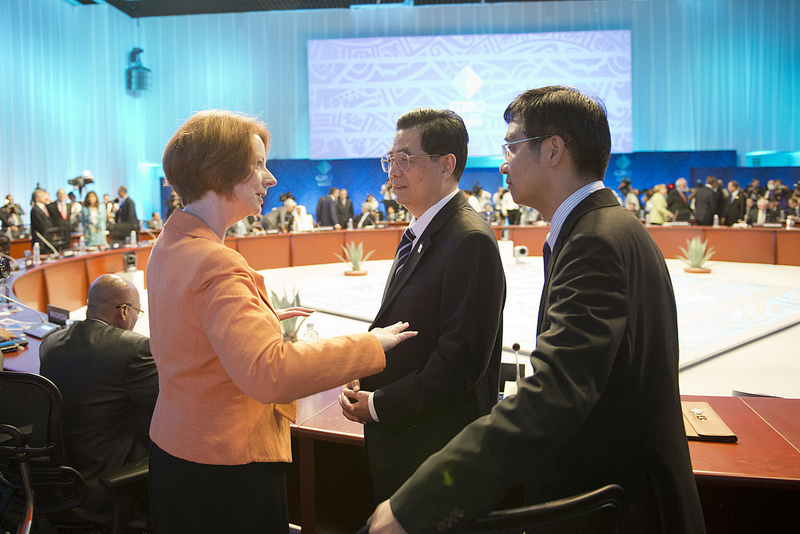 In Hawke’s first term, the foundation of APEC lay well in the future. Hawke faced a caucus revolt and an embarrassing reversal of his decision that the US could test MX ballistic missiles by lobbing them into waters off Tasmania. Hawke had to wrestle for control of foreign policy with the man he deposed as leader, the Foreign Minister, Bill Hayden. The Hawke–Hayden policy struggle was relatively silent but intense, especially when Hayden argued that the US bases on Australian soil could be used to give Australia leverage in talking to the US about nuclear disarmament. Hawke was fortunate that the deposed-leader-as-Foreign-Minister in his cabinet was staunchly loyal to the Party and seldom leaked against the Prime Minister. Gillard had no such luck. John Howard conceded in his memoirs that in his first year in office he got China policy badly wrong. And he was burdened with another deposed-leader-as-Foreign Minister who looked accident prone in the first term. Alexander Downer’s gaffes over cuts in aid loans to Asia meant he was dangerously close to talking his way onto the back bench. The upsets of the first years gave few signs of the confident performance that was to follow as Australia sailed through the Asian financial crisis, led interventions in Bougainville, East Timor and Solomon Islands, and gained membership of the East Asia Summit. After a couple of notable early stutters, Gillard’s record on foreign policy was a model of diligence. It wasn’t brilliant, but it was reliable. She had safe hands and applied herself with a lawyerly competence to mastering the impressive array of multilateral groupings that now demand an Australian PM’s attendance and attention. More on Gillard’s international performance in my next column. Graeme Dobell is the ASPI journalist fellow. Image courtesy of Flickr user Gobierno Federal.